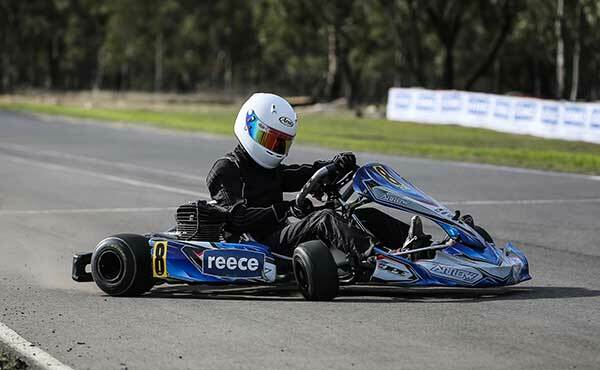 Victorian Country Series Round 4: Wimmera Kart Racing Club, 15-16 July. A GLORIOUS sun rise gave all the impression it would be a lovely day in Horsham at the Wimmera Kart Racing Club as the members had worked extremely hard to produce a fantastic looking facility to host round 4. Well, the sun quickly disappeared behind the clouds and a bitterly cold wind travelling at 35+kph kept the temp down to a chilly 8*, however the forecast rain stayed well away. While spectators rugged up to keep warm the action on track was hot and the 170+ entries provided yet again some of the best racing the 2017 series has seen. Wimmera’s hospitality was second to none and nothing was too difficult to accommodate the punters. 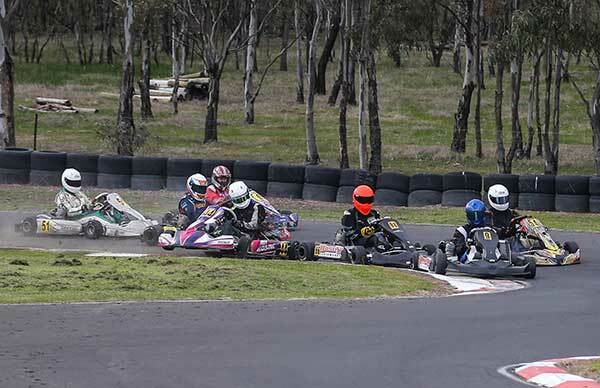 The penultimate round of the 2017 Victorian Country Series hits Hamilton on Sept 10th. The pioneers of the meet took on the windy conditions and opened the account with some awesome racing, Ashley Lear took the pole in an exciting qualifying session, Jordan Rae relished his starting position and won the battle for turn one as the cold conditions weren’t doing anything for the tyres in the way of heat, and the old slide n guide method was in full use until a few laps in. Jordan Pianezzola was having better luck this round and with the air staying in his tyres the #54 piled on the pressure to #11 Ashley Lear. Meanwhile #9 Jordan Rae had skipped away with a healthy bit of real estate between him and Ashley in heat one. 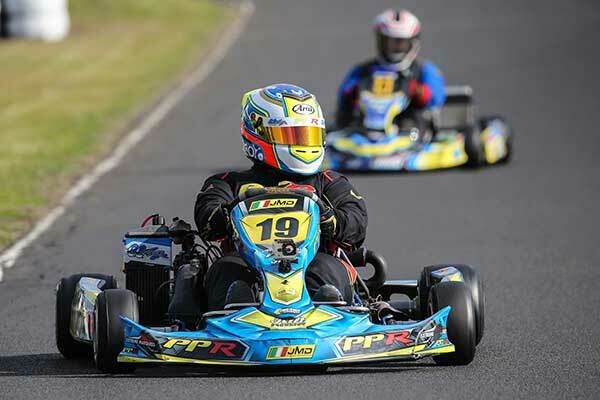 Heat 2 saw Rae skip away early however left the track midway leaving Lear, Pianezzola and Conner Farr to battle for the honours with Lear keeping his nose in front and withstanding the peppering from Pianezzola and Farr. The final Jordan Rae started mid pack but wasn’t there very long and soon assumed the lead but not by much in the early part of the 16 laps. As the final counted down the defense of Lear succumbed to the pressure from Pianezzola as he made his way to second on the podium in an intense battle. With unusual front left tyre graining in the heats, Lear needed to rotate tyres for the final making the podium fight somewhat more difficult. 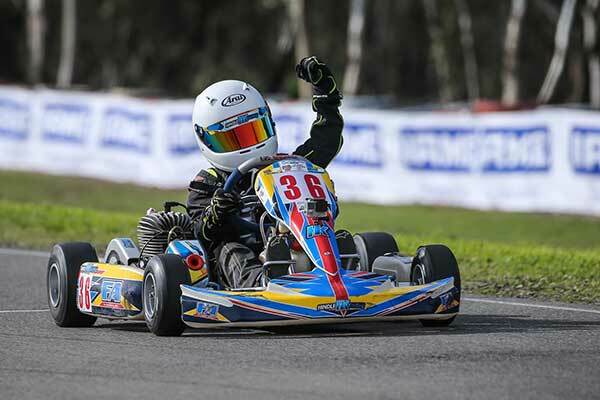 With a big field of Cadet 9s gracing the Wimmera circuit, the qualifying session was as exciting as the racing with #85 Tyce Hodge stealing pole in the dying seconds. 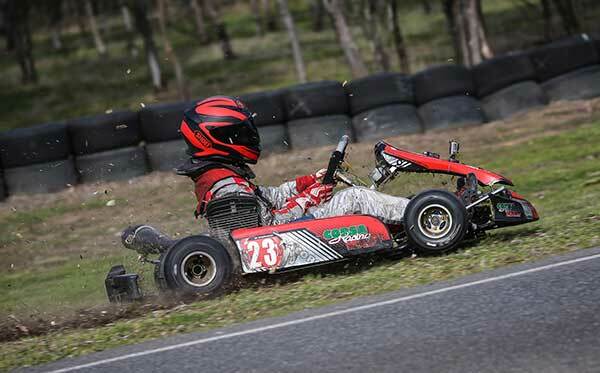 The first heat saw the “rocket” Rusty Ponting in take-off mode early, setting the pace and cleaning up in heat 1. #3 Leo Iannella had the pace to keep with Hodge and Ponting, but #94 Cadel Ambrose started to put it all together in the second heat to change the finishing order. #85 Tyce Hodge would win from #21 Ponting in second after an epic 12 lap battle in which all 3 would cross the line in close proximity. In the final it took a few laps to sort themselves out, but with 16 on the black board it was hard to pick a clear winner in the early laps. 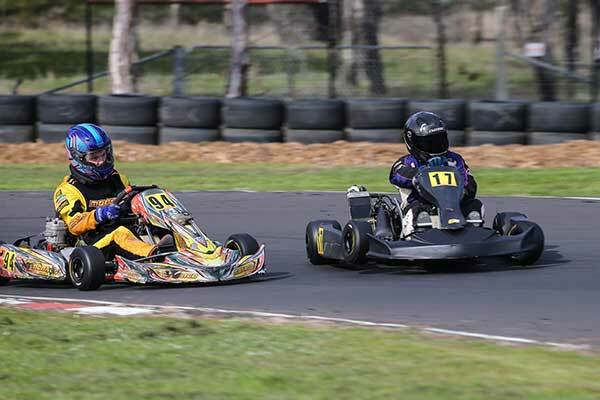 #85 Hodge managed a break of a few kart lengths and led until lap 7, then #94 Cadel Ambrose made his move and wouldn’t be caught for the rest of the race to come home with the win. The #36 of Schmidt started out of 5th and quickly made his way up to 4th and 2 laps later would be in 3rd dropping the Rocket Rusty Ponting to 4th. As always, the Cadet 9s across the field put on an awesome display in round 4. #12 Steve Malkin was the one to watch after having a cracking round at Portland however the #55 of Andrew Stubbs would take pole. The first corner of the heats saw Andrew drop straight back 3rd and #92 Ronald Taylor (who qualified 5th) jumped into the lead. Chaos was almost followed by carnage at turn one with some of the Masters spinning on cold tyres. As they attempted to get going the Heavy class bore down on them as they started their heat. Fortunately all got sorted and away they went. Meanwhile the #92 of Taylor was leading until lap 10 when #12 Malkin made the pass and took the win in heat 1. Heat 2 saw the 2 classes separated by a larger gap to prevent a re-occurrence of the first and making the most of a great start #92 of Taylor would drive off into the distance to lead from start to finish, #12 Malkin drove hard to keep with Taylor but then turned off the loud pedal and settled for sec. #97 Matthew Crane got to 3rd until lap 6 and was passed by #55 Andrew Stubbs and this is where all would finish. 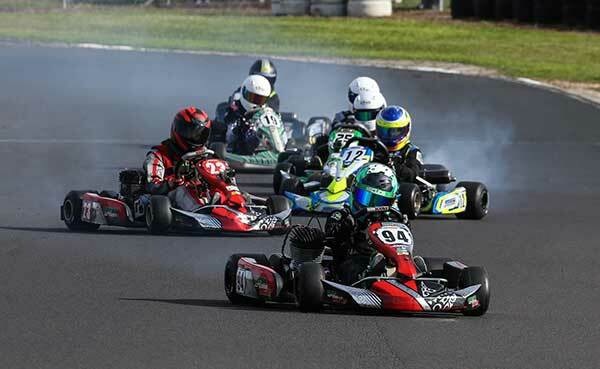 Straight out the gate in the final it was all sorted on the opening lap and the positions wouldn’t change for the masters with #12 Malkin leading from start to finish to claim more healthy points for the series. Coming into the first corner in heat one the Restricted Heavies were greeted with several spun karts from the combined Masters start but negotiated their way through without incident. 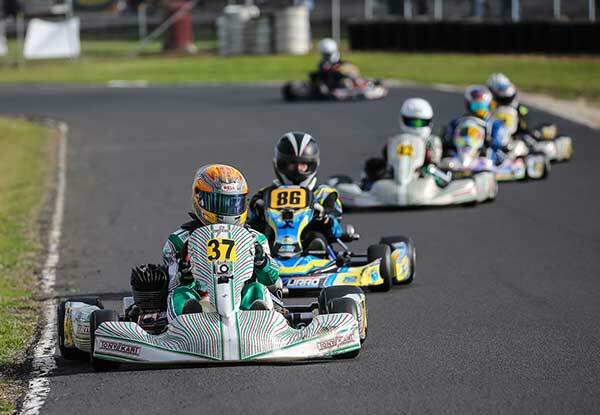 Polesitter #38 Marc Tune would lead for the first 3 laps all the while being peppered by #46 Nathan Van Es who then disappeared further up the road leaving the karts of #38 Tune, #51 Andrew Harvey, #73 Michael (Austrans ) Angwin and the #8 of Kilcullen to go at it nose to tail for the remainder of the 12 laps. Heat 2 saw the Heavies start a bit further back to avoid a repeat of the first and #73 Angwin took the lead from #46 Van Es on lap 6, #51 of Harvey and #8 Kilcullen kept things bunched up in the remainder of race to provide some great entertainment while our pole sitter #38 Marc Tune would drop off the pace. In the final #73 Austrans Angwin took command and wasn’t headed on his way to the flag. #38 Marc Tune found his mojo again in 2nd closely followed by #51 Andrew Harvey. Unfortunately the fight had disappeared from the #46 Van Es kart; apparent mechanical failure relegating him to 5th in the end. 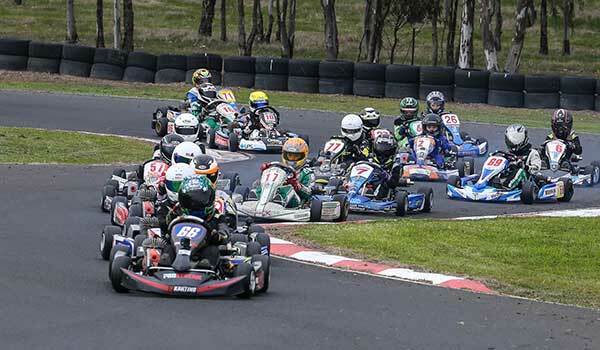 A good size field of Restricted Mediums made turn one interesting on cold tyres as a few visited the grass and bounced off the curbs in the opening heat. #2 Billy Westerveld secured pole in a closely fought qualifying session but it was the #28 of Beau Humphrey that would prove to be Westerveld’s equal, leading until lap 8 where the #2 made his move and would clear out to go on for the win. #69 Phillip Reid had enough pace to be at the pointy end but just couldn’t bridge the gap to Westerveld and Humphrey. A little further back was #16 Phillip Zentai and #99 Barry Clough who both had good pace at Portland. Heat 2 and #28 Beau Humphrey would get the jump on #2 Westerveld with a sensational start only until lap 5 where Westerveld turned on the afterburners and drove away with the win. In the final #28 Humphrey made it 3 out of 3 starts to lead the opening laps but couldn’t stop the Westerveld train and after lap 4 wouldn’t be headed. #69 Phillip Reid switched gears and took it up to Humphrey and on lap 10 his hard work paid off coming home in second. Right from the start of the day #23 Jai Stephenson claimed pole and would set the pace. #12 Ryan Morgan had other plans and applied the pressure to the #23 and the lead changed 3 times throughout heat 1. Heat 1 was a precursor to what was to come as #94 Kobi Williams now joined in on the Stephenson – Morgan show and by lap 8 was in the lead. 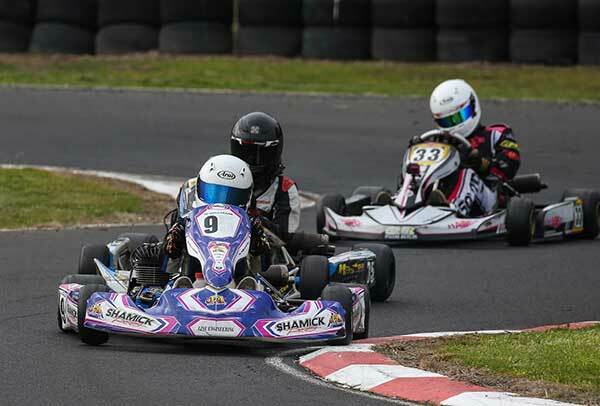 The trio exchanged places multiple times through the 12 lap heat which was one of the epic races in this class on the day. The final brought a whole new level and a fresh participant at the front #25 Corey Herbertson decided it was time to run with the pack and it was a commentator’s dream with action from start to finish. #23 Jai Stephenson, #12 Ryan Morgan and #94 Kobi Williams were trading places more times than the share market moves in a day and the final literally came down to a drag race finish. On the last turn #23 Jai Stephenson on the outside went grass and would end up 13th as the 4 some tried to negotiate the right-hander to provide a thrilling finish to what had been some awesome racing. 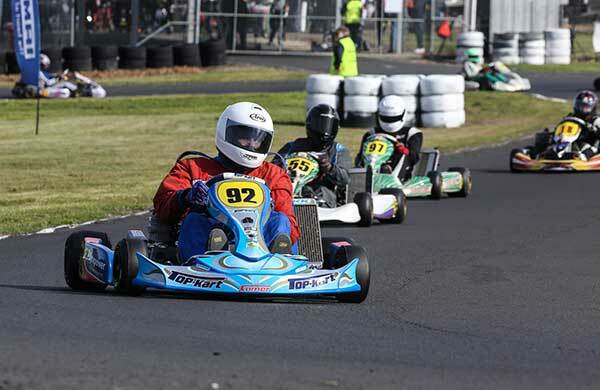 Entries in both KA3 Senior Light and KA3 Senior Medium had a shot in the arm at Horsham, with more karters than previous rounds and a small grid capacity necessitating they were not combined on track. #86 Nicholas Trebilcock grabbed pole in a very tight qualifying session for the Lights. #37 Jack Bell would join Nick on the front row and would make the most of the starts and once in clean air he drove away with the rest in tow. #86 Nicholas T manage to catch and pass Jack on lap 10 of heat 1 only to have Bell pull the switch back and regain the lead and take the heat. #42 Joel MacPherson briefly showed pace in the first heat but in the second poured on the extra gas and would see 2nd place quite easily for heat 2. In the final five drivers made it a great race to watch. 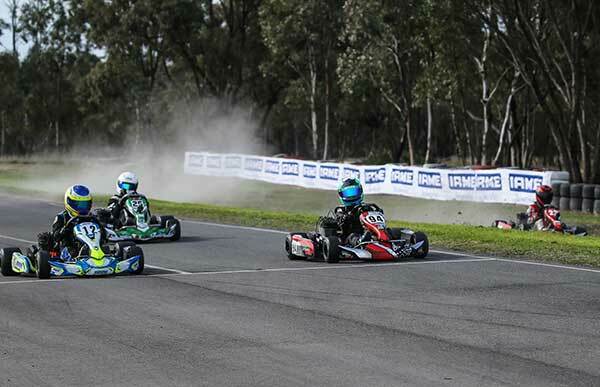 The #14 of Nikki Watson had genuine pace at Portland but was lacking something here at Wimmera and ended up racing hard for the last podium place with #7 Simon Fallon, the #2 Antonio Cafiso and #42 of MacPherson. MacPherson would come home in 3rd behind #86 Nicholas Trebilcock and the eventual winner: the untouchable #37 of Jack Bell. 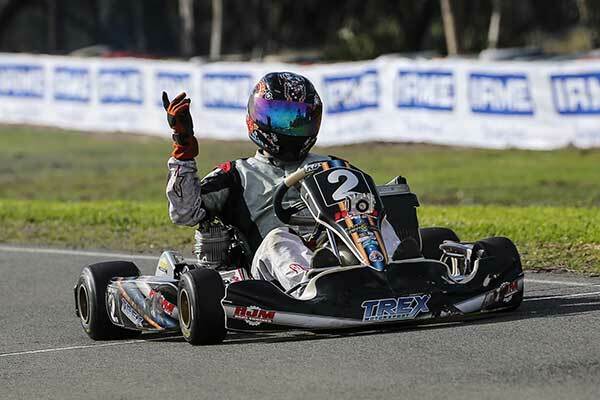 You can’t teach an old master new tricks – especially at his home track and the number 20 of series sponsor Remo (Racing) Luciani made it look like a practice day and left the field to sort out the minor placings. Mitchell, Thomas, Baker and Jackson raced hard to grab the remaining places on the steps with the 4 of them trading places regularly in heat 1. #7 Chris Thomas looked like the only contender that might catch the 69 time champ but to no avail. 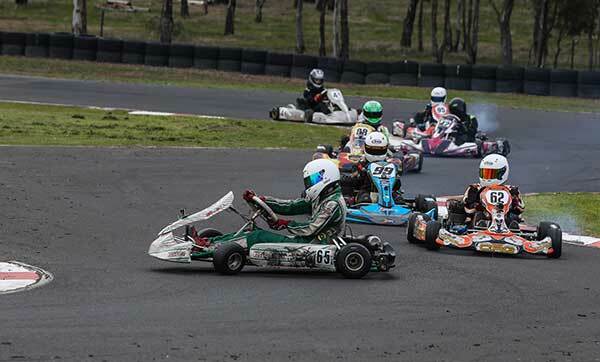 Horsham member Ash Mitchell made maximum use of his local knowledge – getting a great early jump on the field on the coat tails of Remo, before running some savvy racing lines at the end to prevent the late charging trio of #7 Chris Thomas, #19 Alex Baker and #13 Aaron Jackson from stealing his well deserved 2nd place. 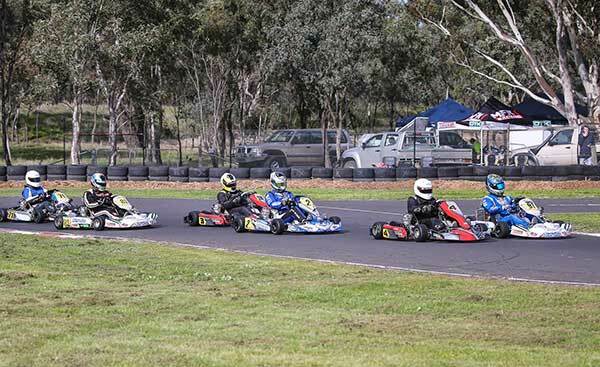 A big field of Cadet 12s greeted the Wimmera circuit and it was action right from the start of qualifying and through the heats. #92 Matthew Domaschenz set the early times but halfway through the session #66 of Will Harper turned up the gas and wouldn’t be beaten to pole from there. Heat one and with so many on the pace turn one was going to be important. #66 of Harper made the best possible and drove away in first comfortably while #92 of Domaschenz had dropped off his pace in other rounds and raced very hard against #23 Joseph Fawcett. 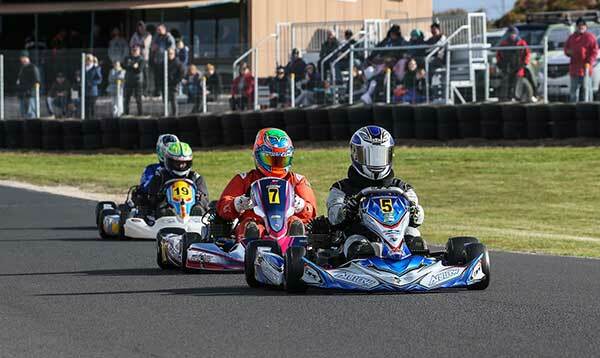 These 3 skipped away leaving #21 Isaac Woodhouse, #33 Jaxson Johnstone and #57 Akasha McEachran to fight for 3rd place. Heat 2 and the same 6 were closer for a short period of laps as #66 Harper would lead from start to finish and #33 Jaxson Johnstone would this time win the battle of the next group. 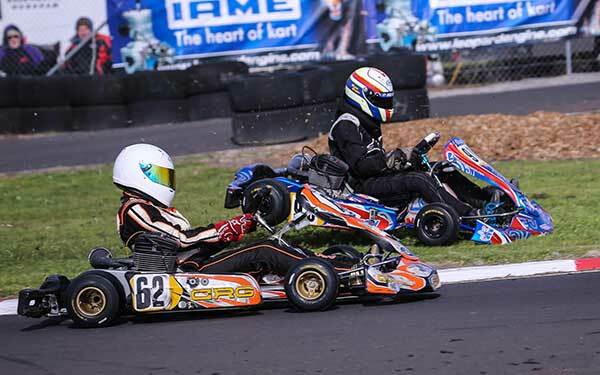 The final and #66 Harper got another great start but this time was peppered by a hail of pressure from the #23 Fawcett eventually passing Harper on lap 9 of 16 and finishing only 4tenths ahead of Harper. Isaac Woodhouse would claim 3rd after a hard fought effort. 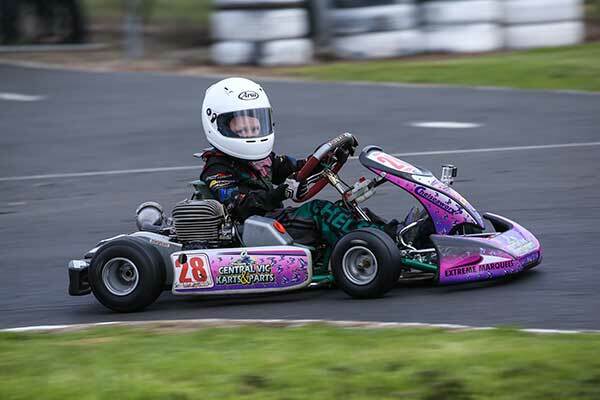 Joe obviously has an affinity for the Dooen Raceway circuit: a back-to-back win from round 4 in 2016. The #70 Aaron Oliver was dominant in qualifying and sealed pole early in the session #99 Adam Slattery Junior would start on the front making it an SA lockout. Heat one on colds was always going to be an exciting opening lap, and turn one provided action immediately. The #99 of Slattery Junior was off exit stage left, re-entering down the field and really never recovered the meet after this. #95 Daniel Hookway seized a great opportunity and slotted into 2nd to become busy defending against a very quick #9 Nathan Williams who would pass the #95 on lap 7 of 12. Heat 2 Williams and Oliver were straight down to business, the 2 had genuine pace and quickly moved away from the rest of the field to engage in their own battle for the lead. 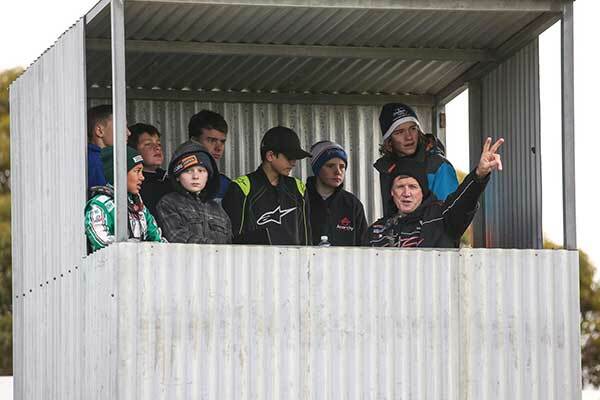 #35 Jordan Malcolm, #33 Aidan Soloman and #71 Maximus Fahey were providing the spectators with outstanding entertainment as they battled hard for the minor placing with Jordan seizing an opportunity on lap 8 to take 3rd. In the final Oliver got the dream start and lead the opening stint with a whole heap of heat from Williams who would make the pass on lap 9 and go on to win in style. The battle was on between Malcolm, Soloman, Fahey and Hookway for 3rd . #95 Hookway slipped down to 6th and #35 of Malcolm worked his way to the 3rd position in an enthralling battle for the points in the series. Again a good size field of Restricted Lights were on the island to chase the points and in qualifying it was a guess who would take pole but right at the end it was #7 Gerry Westerveld who would end up leading this large contingent. Heat 1 and Westerveld missed the start, giving #98 Andrew Sotiropoulos the advantage into turn one. That disappeared on lap 2 with Westerveld regaining the position and driving away to take the first heat. The 2nd heat and again Westerveld missed the start but tried some hang time on the brakes to make up for it; sailing through turn one still on the island but now down in 4th. 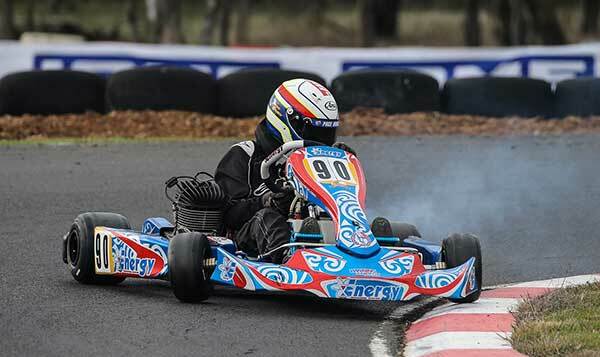 Kart #3 of Lachlan Hill was in 2nd at this time and gave chase to the #98 eventually passing on lap 7 to take heat 2. #33 Alexander Barallon would surprise Westerveld on T6 and grab 3rd. The anticipated final was going to be one to watch and see if Westerveld would make the same mistake for a 3rd time? But he`d learnt his lesson, got the perfect start and led the entire race from go to whoa by 2.1 sec ova #98 Andrew Sotiropoulos and #33 Alexander Barallon, who was only .154 of sec behind the #98 to cap off a great and exciting restricted light race. It would seem a lot of people are losing weight as this class is suffering excitement from dwindling numbers. #3 Adam King missed qualifying but this didn’t trouble the #3 as he battled with #97 Daniel Richert and the #2 Aaron Jackson. Heat 2 and trouble was in the air with #3 Adam King only completing 3 laps and not much further on Daniel Richert would drop a chain coming out of turn 3 elevating #71 Paul Feely to 4th and claiming some good points in the series. In the final #4 Scott King, whose day was going like clock work out on his own would clean sweep the Heavies leaving a depleted field to round out proceedings. #2 Aaron Jackson would come home in 2nd some 3.2 secs behind King and #82 Luke McPherson a further 6+secs back with @71 Paul Feely only 7 tenths off him. 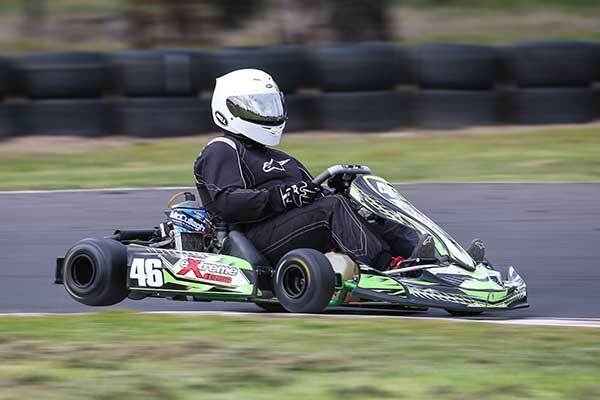 #97 Daniel Richert would drop a chain again in the final to have a DNF and #3 Adam King a DNS after engine failure. 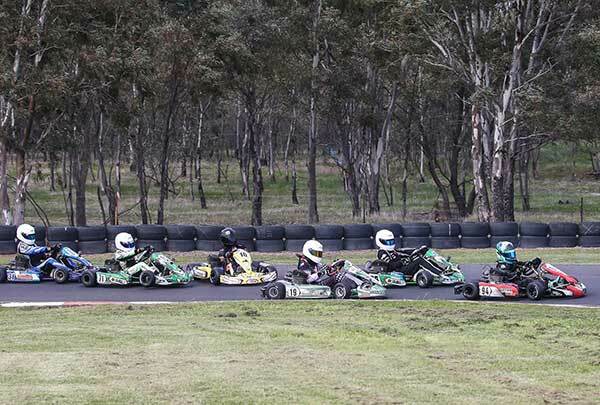 With the absence of regular competitor #16 Cody Gorringe (due to an horrific rollover suffered in a previous race meeting) the field was left to battle it out in the chilly conditions. Qualifying was like a poker game and as quick as one would post the fastest time another would trump it. #11 Hamish Allan would eventually put a full house down to claim pole and #95 of Nathan Williams would join him on the front row. Heat 1 and turn one was always going to be the one to watch as the big and fast field made their way into it with all vying for bragging rights. After the shuffle it was #65 of Tyler O`Leary that would lead the field for the first 5 laps until he succumbed to the Williams pressure. Our pole sitter went to 4th and #13 Ryan Bettess jumped into 3rd with a freight train of drivers rounding out the field. Heat 2 and as the start was building you could feel that something was going to happen as all wanted the hole shot. Next minute #90 Ethan Church was in take-off mode and rode through the turn one over the top of #62 Amber Miller who would come out in 4th but make her way to 2nd for the heat. #90 Church would drive like a man possessed to regain 4th. # 9 Nathan Williams would lead from the start until lap 11 when the throttle cable broke at turn 4 handing the win to Allan. Turn one after the start to the final was all calm as everyone made it through and in control was #11 Hamish Allan and from there was never headed for the 16 lap journey. #13 Ryan Bettess would see the entire race from second. 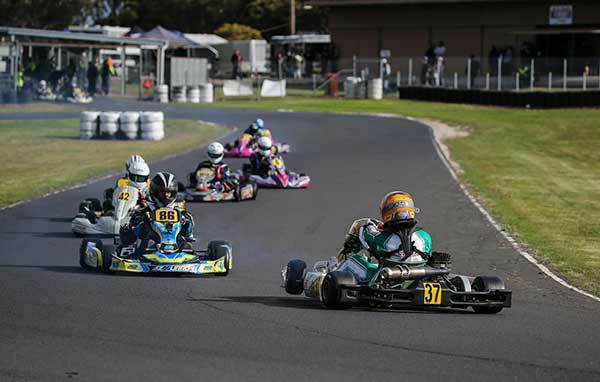 Due to his DNF Williams started out of 5th for the final and provided some of the best racing of the weekend between #88 Declan Foo, #17 Oliver McNaught, #65 Tyler O`Leary and the #62 of Amber Miller. Congratulations to our Wimmera Kerbriders of the Day. Each picked up some handy Maxima Oil and Motul Chain Lube for their impressive driving. We also gave away some prize packs to 5 random winners, which included Dunlop Tyre Lube and throttle cables.